Gib hier bitte den gewünschten Schriftzug ein (z.B. "Name Herz Name", "Leos & Lillys FressBar", "Name Anker Name", Name Pfoten Name. For several four-legged friends, we offer this charming feeding station with three nails. 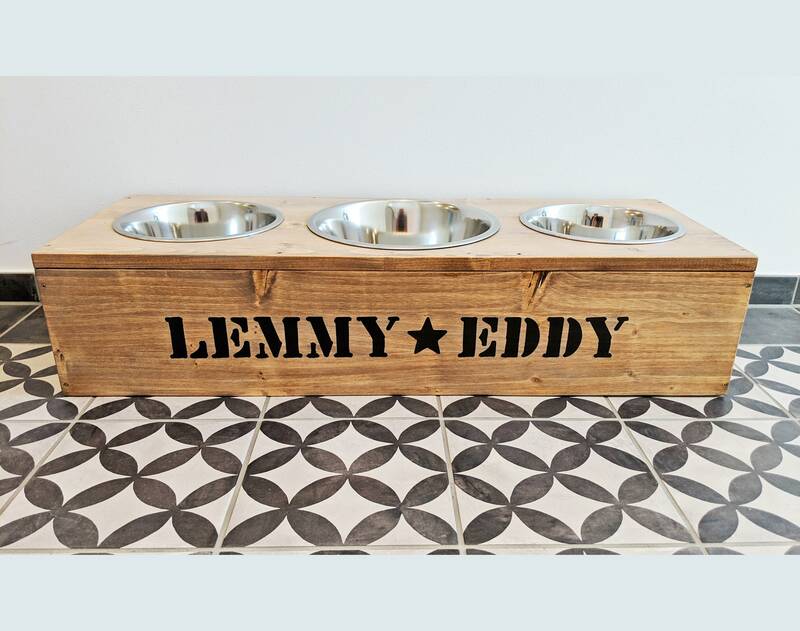 The sizes M, L and XL are suitable for smaller dogs, kittens, medium-sized and very large four-legged friends. Design: "Vintage Oak" (beautiful wooden tone); A special highlight is the individual imprint (e.g. names with heart ♥, stars, paws, anchors, etc.) as well as the choice of two fonts. For a custom-made production with different Napfsizes, we are happy to send us a message. Replacement/additional pots can be ordered separately. The photos serve as patterns. Small deviations are possible, because each feeding station is handmade and is therefore unique! Any questions? Then you can write to us via the contact form or under info [!at] toultime.de. We look forward to hearing from you!